We would like to answer your questions on the most important topics at the NK Help Center. You will also be able to download the operating instructions here shortly. Some Nielsen Kellerman devices can now be connected to your Windows computer or Mac, as well as to the LiNK mobile apps for Android or iOS. Depending on the version, you can use it to save the training data and update the devices. In case of problems we always recommend to install the latest version of the software first, known bugs have already been fixed with the update. Should you still not make any progress, please contact us by mail and we will be happy to support you. You can find the instructions and downloads directly on the NK website. Here you will find the current versions directly from the manufacturer. 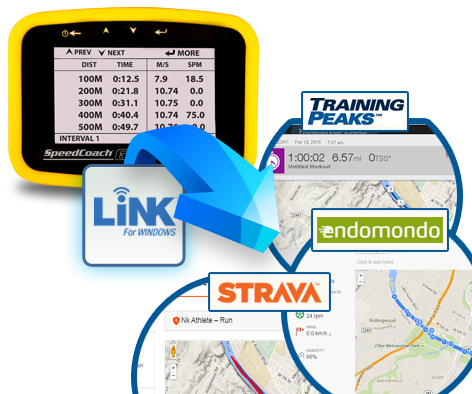 The LiNK software for transferring, viewing and exporting data files from the Training Pack versions of the SpeedCoach GPS Model 2, SpeedCoach OC2 and SpeedCoach SUP 2. Contains the driver for the dongle and a detailed description as .pdf in english.